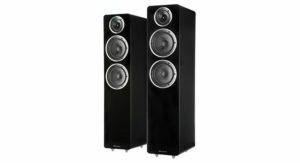 Not many floorstanders can claim to stand on their own two feet (well, in this case four) quite as independently as the Wharfedale Diamond A2 speakers. 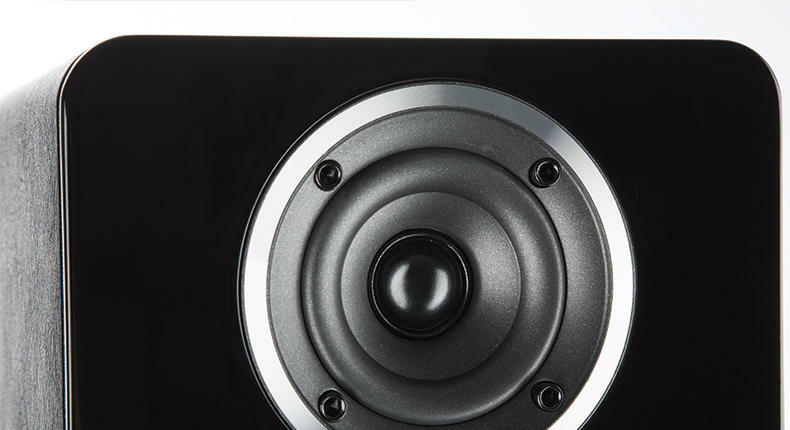 With built-in amplification, these powered speakers could be considered as a just-add-a-source hi-fi system – a compact and practical substitute for the multiple boxes and racks that make up a room-hogging set-up of separates. Only an ashtray-sized control hub, the H1, stands in the way of total autonomy. It’s what your sources connect to, via the hub’s coaxial, optical or RCA inputs, or aptX Bluetooth. The H1 then wirelessly sends the music signal to the speakers solely over the 5.8GHz frequency band – avoiding the often-crowded 2.4GHz frequency for supposedly less interference. 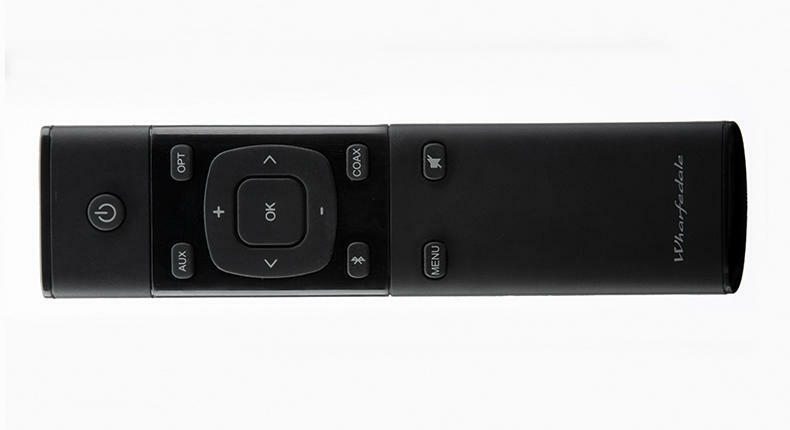 The H1 box is also your go-to for software updates and, if the remote is momentarily lost down the sofa, changing the volume and input too. It simply needs to sit within 20m of the speakers, and as both the speakers and hub are mains-powered, they’ll all need to be within reach of power sockets. Otherwise speaker placement is at your liberty – they can be connected together as a stereo pair (there’s a switch on each for left and right channel assignment) or used individually in mono mode, should you want music in more than one room. 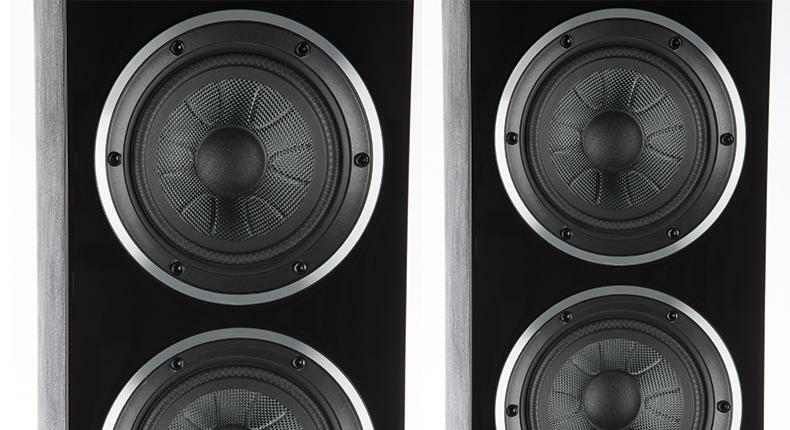 As the name suggests, the A2s are the powered cousins of the brand’s Diamond 200 passive speaker range – more specifically the four-star Diamond 230 floorstanders. So we aren’t surprised to learn that there’s more than a passing resemblance between the two. The A2s are also 2.5-way, bass reflex-ported towers with the same 25mm fabric dome waveguide-incorporating tweeter (also featuring in the Diamond A1 speakers, the standmount versions of the A2s) and twin 16.5cm woofers (up from A1’s single 13.5cm one). They prove a harmonious match in the Diamond 230s, and with help from a specially designed crossover, their union is a happy one here too. 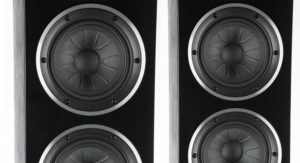 The frequencies are well integrated, producing a soundstage that’s nicely balanced. 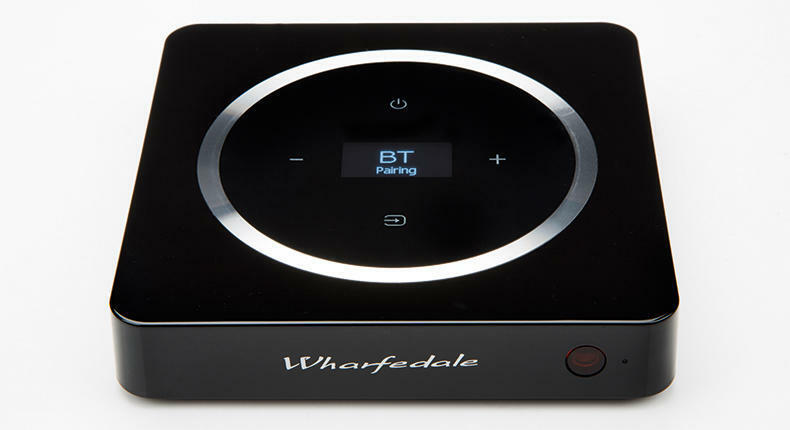 But it’s the Wharfedale’s authority and expanse, which a pair of passive floorstanders and separate amplifier totalling the same money would struggle to match, that leaves the more lasting mark. Indeed, 100W amplification proves plenty to drive the Wharfedales. Playing Robert Wyatt’s Shipbuilding, we’re treated to a full wall of sound and a believable stereo image that’s as open and spacious as it is involving. Within that, the piano, cello and cymbal are presented in trifle-precise layers, while the vocal oozes through the middle resolutely and with focus. The Frank Sinatra of easy listening, the A2’s balance is about as middle-of-the-road as it gets – and we say that in a positive light. 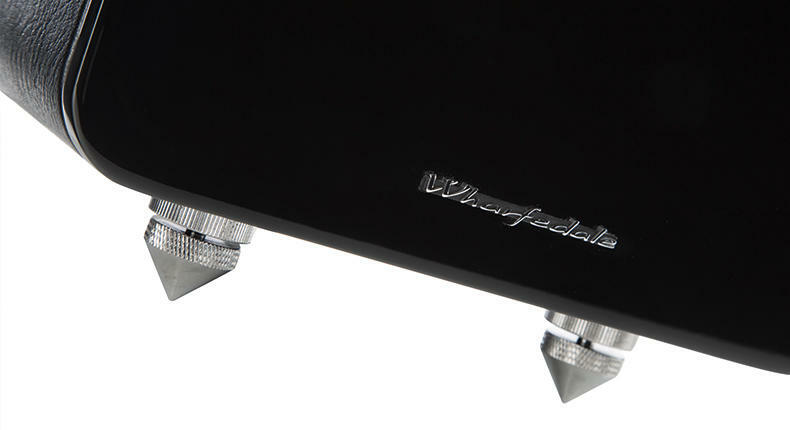 There’s natural warmth and fullness to the presentation – a trait we’ve come to expect from Wharfedale hi-fi. Though not the liveliest of characters, the Diamond A2s scoot through the brisk orchestration of Miles Davis’ Deception (from our Naim server via coaxial) with agility and dynamic sprite. At no point does the instrument playing sound routine, instead it’s exuberant and full of varying textures. The trumpeter’s solos are sweet, musical and indicative of the A2’s impressive dynamic perception, the dynamic variations in his longer exhales hard to miss. We wish the level of refinement and detail in the midrange would also extend to the treble though. 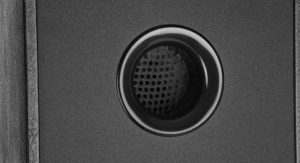 Slight hardness taints the edges of the perpetual cymbal tapping – something that removing the tweeter’s grille emphasises – and seems more monotonal than it ought. 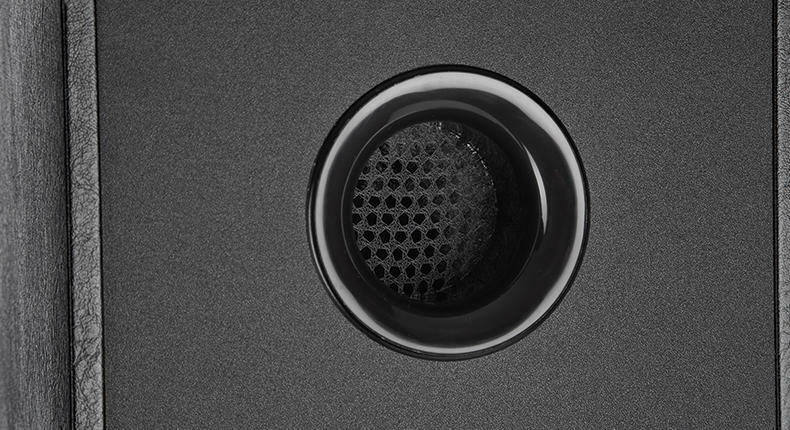 The depth and agility of the speakers’ low frequencies means the tuneful bassline underpinning Kendrick Lamar’s King Kunta moves along eagerly, rightfully setting the upbeat pace for the track rather than stalling it. However, these Diamonds aren’t the sharpest tools when it comes to rendering its funky rhythmic cadence, and they don’t always hit the mark with timing. Without greater precision and punctuality, instrument cohesion isn’t all that convincing. The 91cm-tall towers look exactly how they sound: muscular and brawny. Again, they are unsurprisingly not all that different from the £500 Diamond 230s; their likeable appearance is similarly characterised by a top-heavy driver configuration, silver driver surrounds, and a glossy black (or white, if you’d prefer) baffle. This time, though, a black leatherette finish wraps around the top and sides. It is smart enough, although it doesn’t make the speakers look much more deserving of their price tag than the 230’s more modest one. Instead of speaker terminals around the back, there is a panel for the switches, including ones for bass adjustment and channel assignment, and an LED light that glows green when the speakers are successfully paired. Initially, establishing their connection to the control hub takes mere moments using the manual’s step-by-step instruction, and from then on pairing is automatic. Easy to set-up, well equipped, and authoritative performers: the Wharfedale A2s, like their standmount siblings, epitomise a good concept pretty well executed.